Author MaximePublished on 23 December 2016 23 December 2016 Leave a comment on Tango magic exists! Those were my happiest seconds of 2016. It took me almost 4 years to get from an absolute beginner never danced before to the first public performance. Just thank you so much Sophia de Lautour, Paul Wagner and Paul Warren for your lessons and passion and patience in explaining tango magic! 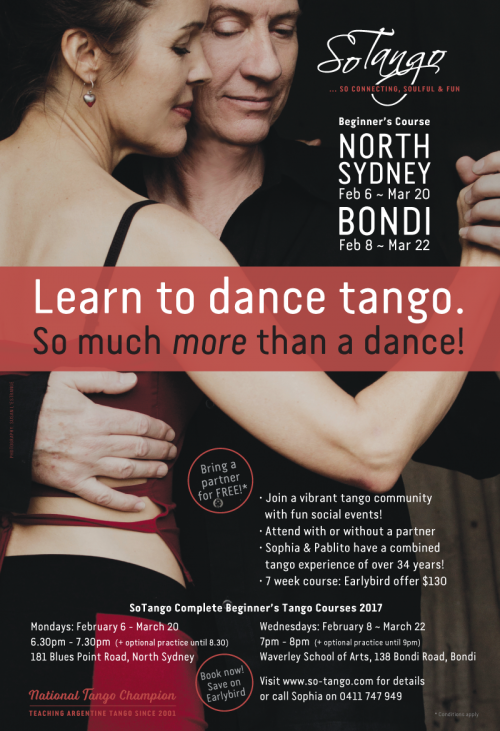 If you are pondering to take tango class, think no further, the next beginners course at So-Tango starts in the beginning of February. Sophia and Paul would be happy to lead and follow you from the first basic steps in the class into privy ulterior though warm and friendly life of Sydney milongas. See details on the poster below or click on it to go to the So-Tango web-site.